"I would just like to introduce you to a new Manchester band; their name is Rescue The Eskimo. The band formed in September 2010 and has already created many new tracks in quick succession. Consisting of 4 members which include 3 guitarists and one percussionist, 3 of whom provide the vocals and harmonies. 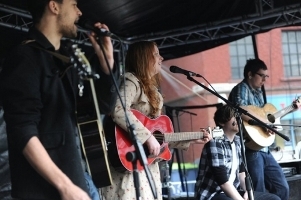 All band members are current students at Manchester music base and are studying on a performing musician course however each band member has experience of being in bands or as solo artists. The band has recently started to take the music to the streets of Manchester."